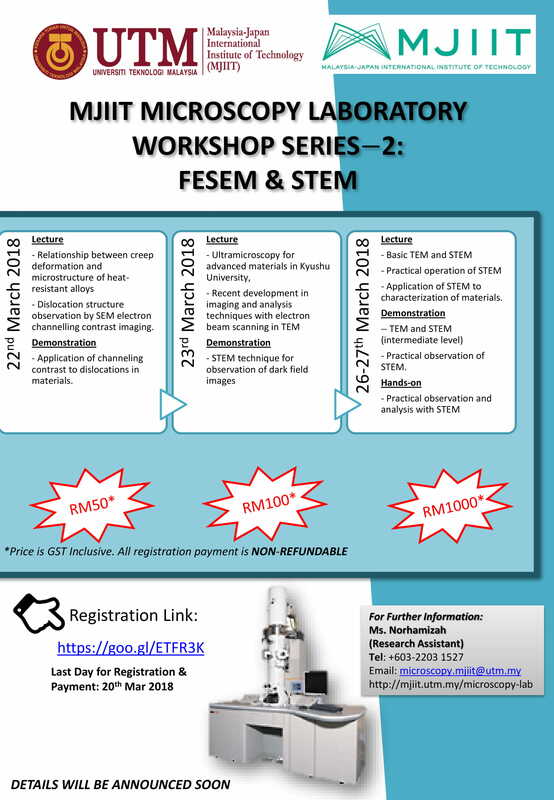 Due to the successfulness of our Workshop Series 1, we are glad to inform that we will organize a new Workshop Series, which is MJIIT Microscopy Laboratory Workshop Series 2 and MJIIT Microscopy Laboratory Workshop Series 3. 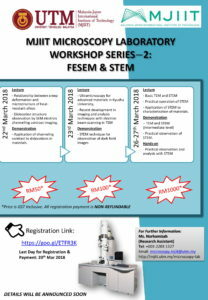 For this time, we are focusing on the operation of FESEM (EBSD) and Intermediate level of STEM. 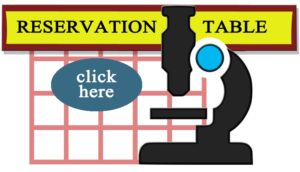 We are pleased to welcoming all related industries and researchers to join our MJIIT Microscopy Lab Workshop Series. We are pleased to welcoming all related reseracher to participate in a MJIIT Microscopy Lab Workshop Series 2 & 3 to be held on 22nd – 29th March 2018 at Microscopy Laboratory, Malaysia-Japan International Institute of Technology (MJIIT), Universiti Teknologi Malaysia, Kuala Lumpur Campus. 3) Application of STEM to characterization of materials. 1. 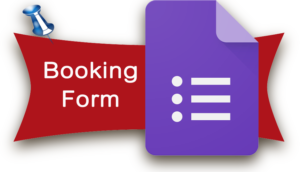 Complete the registration form first before make the payment. We will notify you for the payment. 2. Participation is only confirmed after payment is made. 3. Payment is non-refundable upon cancellation. Details on the workshop can be found in the brochure, as attached. 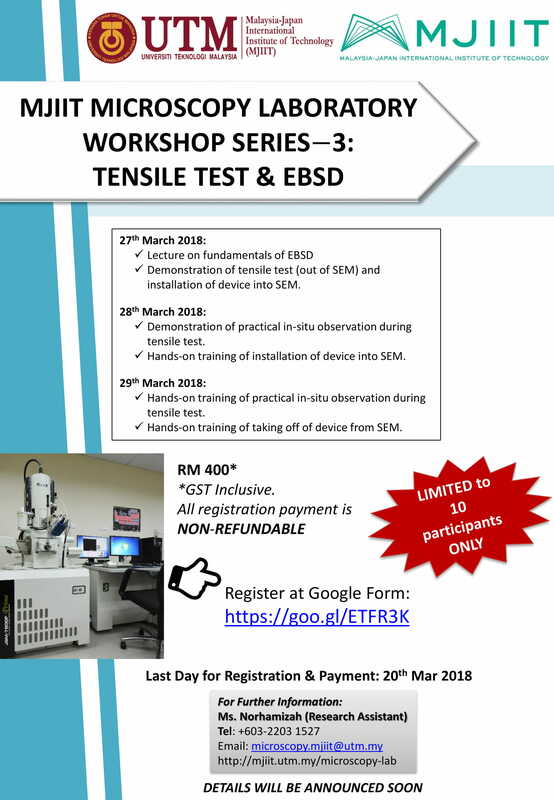 For registration, please click here: https://goo.gl/ETFR3K. HURRY UP!! SEAT IS LIMITED!! We look forward for your participation and contribution and we thank you for your continuous support to MJIIT Microscopy Laboratory.